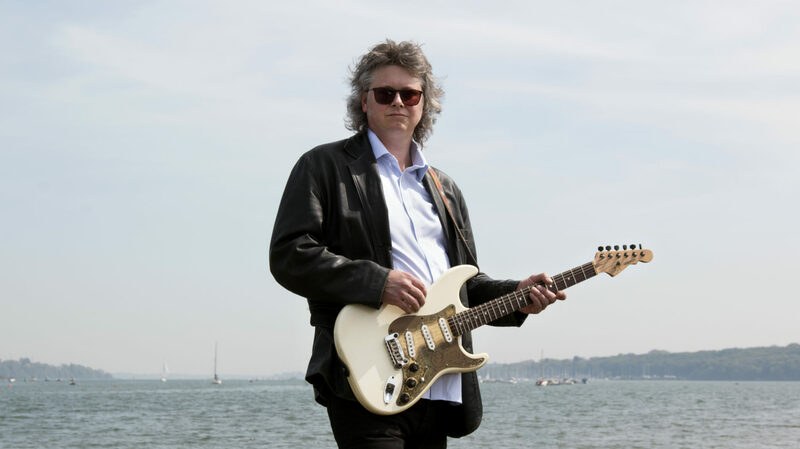 Tim Ainslie and The Vibes, formerly ‘Ainslie’s Vibes’, are a powerful three-piece band from Suffolk, fronted by Tim and showcasing his original material and dynamic guitar playing. “Guitarist extraordinaire Tim Ainslie returns with one of his trademark quirky songs, ‘Pint Half Full’. Classy, funky stuff” – STEPHEN FOSTER, BBC RADIO. The single will be followed by further single releases before the full ‘Pint Half Full’ album in September 2018. Tim has been playing the guitar since he was 15 years old and his amazing ability led him to say goodbye to the day job when he turned professional in 1997. He has since become a highly respected musician and has created a reputation for being one of the most exciting, creative and versatile performers around. Tim has developed a unique style and sound encompassing Blues, Jazz and Funk but also crossing over into Country & Rock making it difficult to pigeonhole Tim’s exceptional playing. He also performs solo and in a duo line-up with a variety of musicians. His early bands include ‘Steamboat to Chicago’, ‘Steel Street’ and ‘Swagger’. Later his spell with the Groove Doctors saw him voted as ‘Best Guitarist’ by Digital Blues Magazine. He has since toured the UK, Europe and US and recorded BBC sessions at Maida Vale with Groove Doctors and his good friend Lightnin’ Willie. Since 2015 Tim has also been playing with Infrasonic and Delta Groove at various venues around the UK and also at the Rory Gallagher Festival in Ireland in May 2015, Delta Groove toured the UK in April 2018. In 2009 Tim had the pleasure of working with Texan guitarist Buddy Whittington Buddy Whittington running a workshop and performing to young people with additional needs, followed by an evening performance with Groove Doctors and Buddy’s band at the Ipswich Blues club. Having remained friends, and more recently in late 2017, Tim performed with Buddy on his UK tour with John Mayall. Tim is actively involved in the local Ipswich music scene not only as a workshop tutor for ‘Musica Workshops’ helping improve the life chances for disadvantaged people through working with music, but also co-hosting the longest running Blues Jam in Ipswich with Adrian Day.